The Gilbert family begin appearing in the parish church and taxation records of Abbotsley, Huntingdonshire (as it was), England, during the mid-17th century. During this early 17th century period, Gilbert surname-holders appear in Protestation Returns (1641), Hearth Tax records (1666), and Admons (1695) for Abbotsley. One set of records notes how a Mrs. Gilbert lost 12 of her 15 cows to 'the murrain' in 1747 (an early term for 'foot and mouth' disease), and that 'His Majesty allowed all or most of the sufferers 10 shillings for each beast' as compensation for their loss. The Gilbert surname first appears in parish records as early as 24th February 1605, when a Maria Gilbert, daughter of John Gilbert, is brought into the church for her baptism. However, it isn't until the early 18th century, when my 6x Great Grandfather James Gilbert appears in the baptism register, that I can confidently identify an ancestor, even though I'm sure the earlier names are most likely related. The family remain in Abbotsley for at least three generations, where they successfully raise families, and also appear as farmers and agricultural labourers. On the 1851 census, my 4x Great Grandparents Edward Gilbert and his wife Susan Gillings were lodging with their son-in-law Thomas Cade of Abbotsley. They were both noted as paupers and Susan is also noted as being blind. My branch of the Gilbert family, through my 3x Great Grandfather William Gilbert, brought my line the 35 miles North-East to the large village of Littleport, Cambridgeshire by the time of his marriage in 1828 to my 3x Great Grandmother Elizabeth Brightley - a native of Littleport. 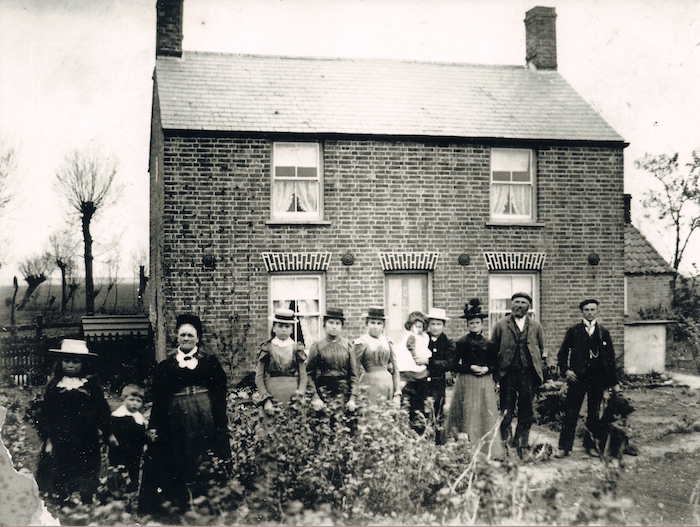 Above: The Gilbert family at Burnt Chimney Drove, Littleport, circa. 1913. Photo: Andrew Martin. Whilst my most recent Gilbert ancestor was my Great Grandmother, the family have continued to work in agriculture, and have established successful farming businesses in the fenland surrounding Littleport. My research has yet to reveal any spelling variations of the Gilbert surname.